Luxor Linkage is a conservation land assembly located in the Rocky Mountain Trench, north of Edgewater, British Columbia. These lands are a critical part of a natural corridor for wildlife and ecological communities. They stretch from the Columbia River wetlands, across Highway 95 and into the Rocky Mountains. Luxor Linkage is named after one of the creeks that flows through the property and into the Columbia River wetlands. It is home to an abundance of wildlife that relies on its grasslands, pockets of deciduous forest, wetlands and rocky outcrops. This project is part of our efforts to secure critical conservation corridors that connect through mountains and valleys in the Canadian Rockies region in British Columbia and Alberta. This is one of the last areas on Earth where the full range of native habitat and ecological communities continue to thrive. In March 2016, the Nature Conservancy of Canada (NCC) secured the 630-acre (255-hectare) “mountain parcel.” In January 2017, NCC acquired the “wetland parcel.” This added another 330 acres (134 hectares) to the Luxor Linkage Conservation Area. Luxor Linkage supports an amazing variety of wildlife. Endangered American badgers, mountain goats, cougars, wolves, bobcats, bears and many other species are found here. The conservation area is particularly important for bighorn sheep, which find high-quality winter habitat here. 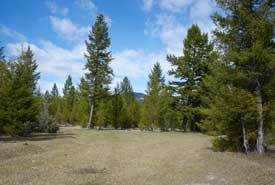 Moose, elk and deer also benefit from the open forest and grassland landscape. 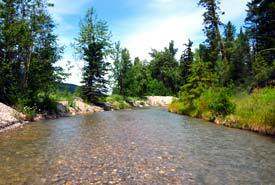 The conservation area connects to Kootenay National Park via Crown land. It provides safe passage for wide-ranging animals like grizzly bear, wolf and elk as they move between the Purcell and Rocky mountains. Independent research biologist Michael Proctor has identified these lands as one of the most important zones between Fairmont and Golden for grizzly bears moving across the valley. The Luxor and Kindersley creeks flow through the conservation area, merging into the internationally important Columbia River Wetlands. These wetlands are critical for maintaining regional populations of several species of amphibians and reptiles. This includes northern leopard frog (re-introduced population), painted turtle and rubber boa. A variety of fish are found here, including westslope cutthroat trout, bull trout, mountain whitefish, burbot and northern pike minnow. Spawning kokanee attract large concentrations of bald eagles each fall. The wetlands also provide nesting, feeding and resting sites for ducks, geese, tundra and trumpeter swans. Great blue heron, osprey, merganser, loon, grebe and kingfisher are also found here. NCC will work to restore the traditionally open forest and grassland habitats. Restoration efforts on Luxor Linkage will complement similar work completed by the Province on nearby lands. 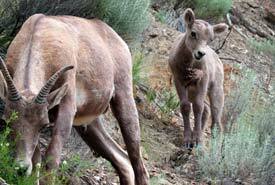 In particular, restoration projects will aim to improve winter habitat used by bighorn sheep.